– Autism and the Somali Community, Minnesota Department of Health. – Barnevik-Olsson, M., Gillberg, C., & Fernell, E. (2008, August). Prevalence of autism in children born to Somali parents living in Sweden: A brief report. Developmental Medicine & Child Neurology, 50(8), 598-601. Google Scholar & UBC eLink: Dare I Say Success? April 6th, 2009 by | Comments Off on Google Scholar & UBC eLink: Dare I Say Success? Searches in Google Scholar are yielding much more consistent results. Possible links are almost always listed as “UBC eLink” and only occasionally as “UBC Library Catalogue” (both go to the same SFX menu). But, alas, no yet. Some problems still exist, but these are due to the poor incoming information rather than a resolving problem on our end. Clicking on “UBC eLink” gives you an abbreviated citation and no full-text results. Clicking on “AIDS References in the Critical…” takes you to the full text. You also see “All 4 versions” at the end of the 2nd result. Click on that, and you get four “UBC eLink” links, three of which take you to three different full-text sources. Conclusion: it’s not perfect, but it does work better than before. So, don’t be disappointed by an initial “No full text available” message. Dig a bit. Posted in Browsers, Databases, eLink, Google Scholar, SFX | Comments Off on Google Scholar & UBC eLink: Dare I Say Success? 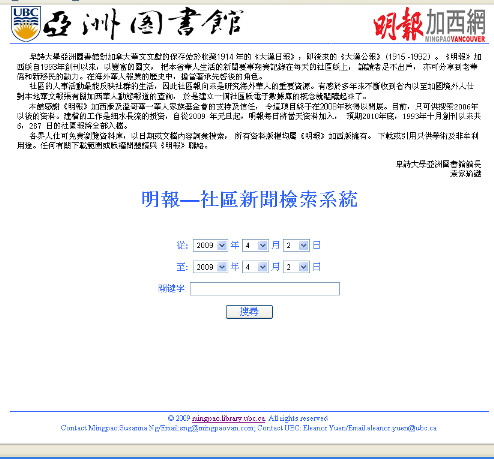 In collaboration with Ming Pao, the digitization of the “Community News” is launched, starting from its inception issue of October 15, 1993. To date, articles after January 2008 are available for searches, free-of-charge. Older archival issues are uploaded to the database weekly or at more frequent intervals. Please click here to go to the database.